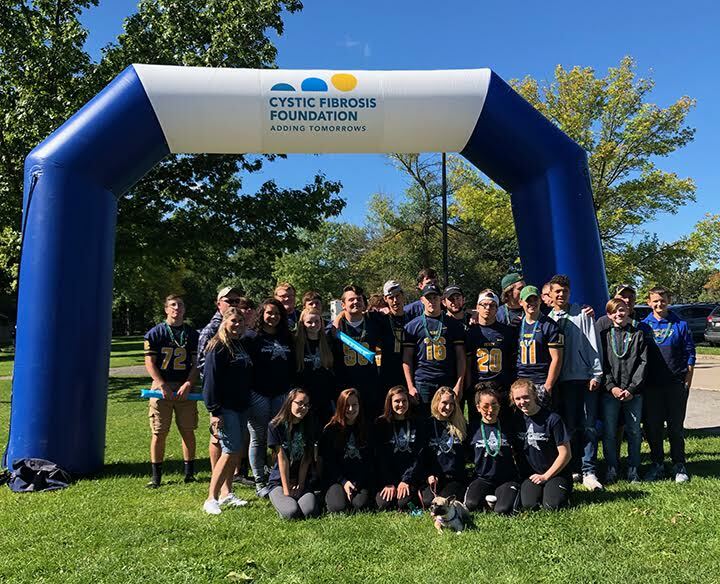 The Perry/Mount Morris (merged teams) varsity football players and varsity cheerleaders participated in the Great Strides Cystic Fibrosis Foundation Walk on Sunday, September 23 at Letchworth State Park in Mount Morris, NY. Our team raised $338 for the cause, but the walk’s website states that $20,131 was raised from just this particular walk. Seventeen players and eight cheerleaders walked the 5K course and supported the basket raffle. Football Coaches Jim Dueppengiesser, Carl Tallman, and Corey Hollister participated, along with Cheerleading Coach Sandy Graham. This is the second year the football team has participated, and first for the cheerleaders. They volunteer at other events throughout the season, but they choose this walk because some of the student-athletes have family members affected by Cystic Fibrosis.